This is an open account, but you need to be logged into it and the issue in it will be available for a limited period, so to see the links that follow in this discussion you will need to be logged into here (http://www.exacteditions.com/sample/anotherman), and when the next issue jumps into that account the links will only be available to magazine subscribers). There are two principal justifications for offering free previews at the browse level for a magazine of this kind. (1) Like all the Dazed magazines AnOtherMan is visually gorgeous and the publisher believes that as users become familiar with the quality of the photography and the advertisements they will be more likely to subscribe. 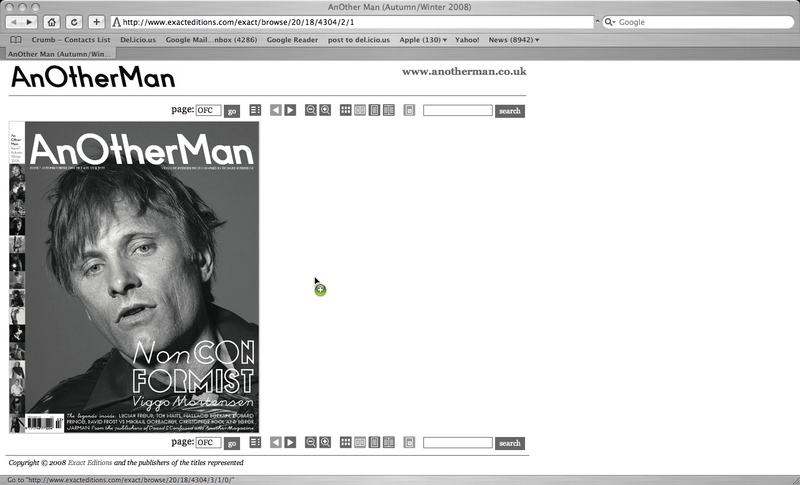 And the 2-page view works nicely since many of the double page spreads are compelling, Ralph Lauren, Burberry, and Paul Smith. Or Lucien Freud, and Viggo Mortensen. One could say that making the current issues open to this free browsing is a bit analogous to the ‘sampling’ which is possible in a newsagent. However since the online browsing is unlimited it is considerably more generous (this issue is a whopper at over 300 pp). (2) The second reason for putting the browseable version of the magazine completely in the open is that it will encourage usage of the advertisements and response to them. Although the format is not really readable, it is completely searchable. So if you are looking for the Belstaff leathers and after browsing the magazine you decide you will actually buy one, you can click on the url or the phone number to place your order. See the corner of p83. That is quite nice.I do have one suggestion: at least make the Contents pages readable. That’s the “ad” for the magazine itself and could encourage one-off purchases at least. Mike: thanks for the suggestion. We agree with it. But doing it in the right way has a few ramifications, and we will need to do a bit of development to get that general and flexible solution in place. Fairly soon…..